The CMM-12R Was Modernized - ! Equipment for Transformer Oil Reclamation. GlobeCore. Dear friends, we are bringing to your notice that last week all the works on improving the CMM-R unit were completed. The new unit features a range of new options that favor transformer oil regeneration process. They include: (1) uninterrupted transformer oil reclamation for 24 hours a day with no stops for sorbent unloading and reloading; (2) equipment controlled by GSM-module; (3) no transformer oil losses during regeneration: (4) the improved software makes it possible to control the condition of all significant parts of the unit including remote operation. The capacity of the modernized CMM-12R is about 4 m3 per hour/1056 Gals, per hour. The connection to the transformer is trouble-free and lasts for 20-25 minutes. The controlled operator’s room is equipped with a computer and air-conditioner. 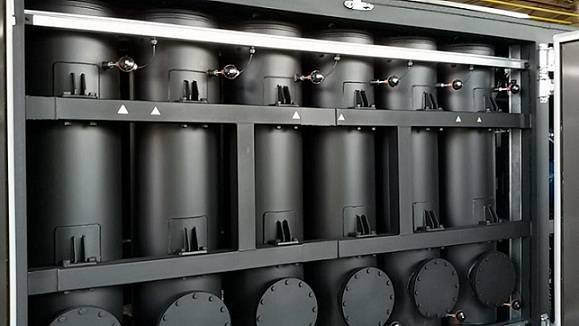 Now it is real to regenerate oil round-the-clock!If you have a great amount of waste oil – do not miss the possibility to order this equipment!